Victoria: Government Street. Today some of Government Street was closed to traffic to accommodate the International Chalk Art Festival. Sections of the street we cordoned off for the artist to prepare their masterpieces. 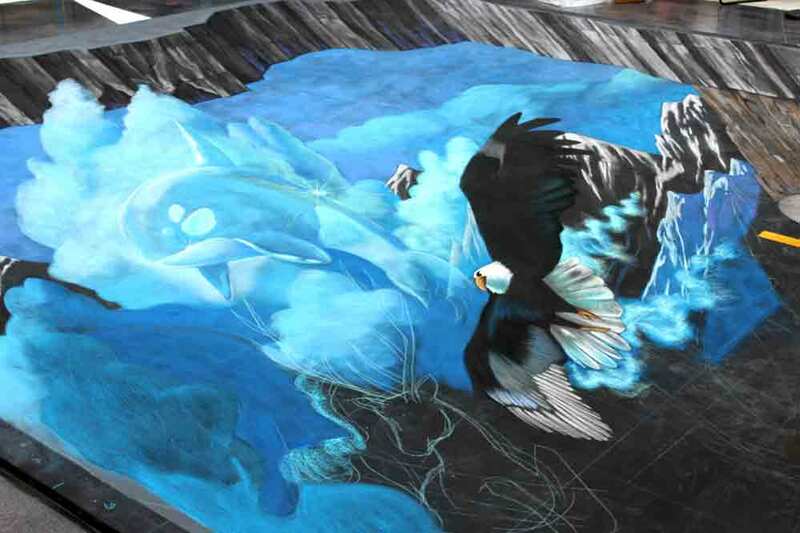 Inside the Bay Centre at Centre Court the world's #1 interactive 3D chalk art artist, Tracy Lee Stum was preparing an amazing work of art. We watched her work for a while and then went to the second floor to get a better view. It was amazing how much more 3D it was from higher up. The Festival end tomorrow, however Tracy's work will be on display until Sept. 30. Check it out. It is amazing. Enjoy our photos. For more pictures, please go to our Facebook page. Labels: International Chalk Art Festival. Tourism Victoria Open House - Don't Miss It!